Yes, you read that correctly: Chocolate blended with Scotch Whiskey. I don't talk about alcohol much on this blog because, well, I've never found a veggie burger with bourbon in it (but if that exists, please invite me to eat it!) But I love whiskey. And I love chocolate. 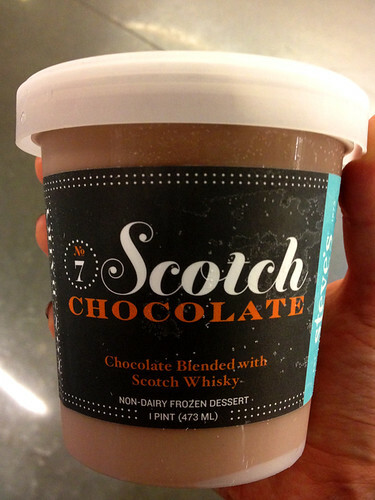 So chocolate + whiskey together in vegan ice cream? That's kind of my idea of heaven. Steve's Ice Cream is made in Brooklyn, but their website says it's available at natural food stores across the U.S. - I even looked up my hometown in Virginia, and it says Steve's Ice Cream is available there too! Not all of their flavors are vegan, and the packaging does not make it obvious which ones are at first (look for the small print that says "non-dairy" at the bottom of the label), but they have a few other vegan flavors in addition to the Chocolate Scotch... although I have to confess, I have not tried them yet because I just can't help myself from always buying the flavor I am obsessed with. Available at other natural foods stores around the U.S., check website for locations. Huh. Well that sounds interesting. I don't love whiskey (I'm a clear liquor girl), but I might like it in ice cream. With chocolate!